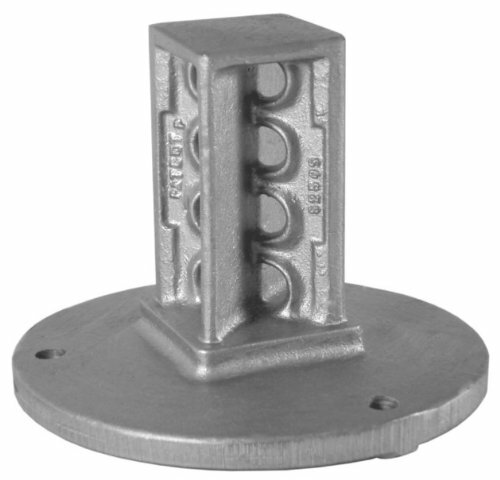 The SNAP'n SAFE surface mount breakaway square sign post coupler is made of cast gray iron, withstands winds of 120 mph. Easy installation. Simply drill (3) holes in concrete using the base as guide. Secure coupler to concrete with (3) bolts. Attach sign post with (2) corner bolts. Installation hardware included. Cost savings - Install or repair sign posts in half the time with one person. Roads are safer - the sign post will no longer strike and penetrate the windshield or roof of a vehicle during a collision. No anchors to repair and no concrete boring - minimize crew exposure to traffic, reduced liability. Breakaway sign post couplers, NCHRP Report 350 Compliant. Designovations now offers new technology with the SNAP'n SAFE breakaway sign post couplers. Using a vehicle specified in the existing Report 350, this new technology meets and exceeds the more stringent damage levels contained in the updated NCHRP Report 350 specifications for ground mounted sign supports. 9 lbs weight. 2" Size of sign post. If you have any questions about this product by SNAP'n SAFE, contact us by completing and submitting the form below. If you are looking for a specif part number, please include it with your message.